I did a smaller pea planting this year, but decided to plant three different varieties in one bed. The pea plants are huge! They’ve grown so much since the last photo, taken April 1. From left to right, I have Taiwan Sugar, Sugar Sprint, and Oregon Giant II. In retrospect, planting the Sugar Sprint in the middle wasn’t the best idea because the plants are smaller and are being crowded out by the Taiwan Sugar and Oregon Giant. Nonetheless, all are full of flowers and small peas are forming. I see a stir fry happening this weekend. Yum! 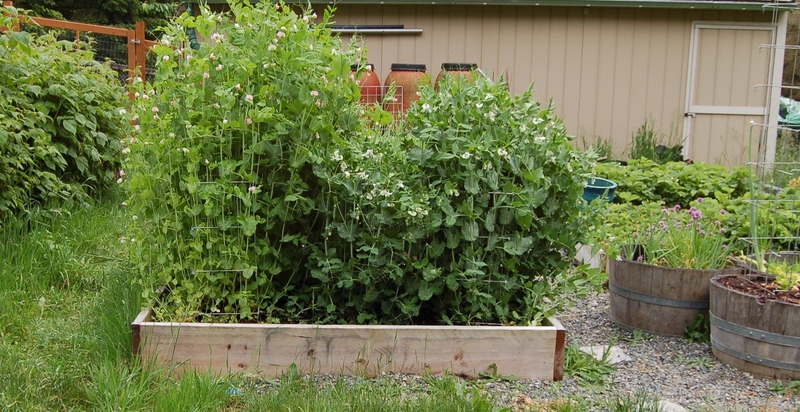 This entry was posted in Gardening and tagged peas. Bookmark the permalink. Nice! I was just out for an evening stroll through the garden and was lingering by the pea patch to admire the sheer beauty of all the white blossoms blanketed throughout the dense greenery. I love it when the peas are blooming!